The Linac Coherent Light Source (LCLS), built on the legacy of the Stanford Linear Accelerator, is the world’s brightest source of hard X-ray laser light, a billion times brighter than any previous source of hard X-rays in existence. Like an ultra-fast, ultra-bright strobe, the LCLS opens new doors on atomic and molecular structure and dynamics, at very high resolution and on extremely short time scales. Experiments using the LCLS are illuminating the formation and breaking of chemical bonds at the atomic level, showing how materials work on the quantum level, and revealing the structures of key biological molecules and viruses. This talk will focus on the conception, construction, and start up of the LCLS, as well as some of the first experimental results, with a view to the new frontier of science that this remarkable tool has enabled. This scientific and technical achievement will be set against the backdrop of the evolution of a National Laboratory, SLAC, which has reinvented itself and its science in the delivery of this new facility. PERSIS DRELL is Director at SLAC National Accelerator Laboratory and Professor of Particle Physics and Astrophysics at Stanford University. She received her B.A. in mathematics and physics from Wellesley College, and her Ph.D. in atomic physics from the University of California, Berkeley. 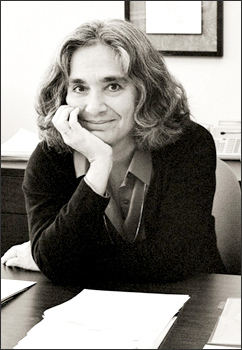 She joined the Physics Department at Cornell University in 1988, becoming head of the high-energy physics group in 2000, and Deputy Director of Cornell’s Laboratory of Nuclear Studies in 2001. In 2002, she joined SLAC as Professor and Director of Research. She became SLAC’s Director in 2007. Her current research activities are in the area of particle astrophysics. Dr. Drell is a member of the National Academy of Sciences, a fellow of the American Physical Society, and member of the American Academy of Arts and Sciences. She has been the recipient of a Guggenheim Fellowship and an NSF Presidential Young Investigator Award, and she was the Morris Loeb Lecturer in Physics at Harvard University in 2006. Dr. Drell is the recipient of numerous other awards and has served on a variety of advisory committees concerned with national research, facilities, and physics funding priorities. President Robin Taylor called the 2,287th meeting to order at 8:19 pm September 9, 2011 in the Powell Auditorium of the Cosmos Club. Ms. Taylor announced the order of business and introduced six new members of the Society. The minutes of the 2,285th meeting were read and approved. Ms. Drell began by describing the early history of the Stanford Linear Accelerator Center, built in the early 1960s to answer questions about the fundamental building blocks of matter. The unique capabilities of the two mile long electron accelerator made SLAC a key facility in the field of particle physics, maintaining its position well into the '80s with a series of improvements and major upgrades. SLAC results led to the discovery and characterization of fundamental particles and forces. Scientists working at SLAC won several Nobel prizes. However, as new facilities were planned and built at Fermilab and CERN, the high energy frontier was no longer accessible at SLAC. In the late '90s, after observatories provided evidence that dark matter and dark energy make up 96% of the Universe, SLAC began expanding its strategic focus to include particle astrophysics projects such as the Fermi Gamma-ray Space Telescope and the Large Synoptic Survey Telescope. SLAC underwent a further dramatic reinvention between 2007 and 2009 to focus on the Linac Coherent Light Source, shutting down the B-factory, undergoing major layoffs, and even officially changing its name to SLAC National Accelerator Laboratory. Ms. Drell emphasized that, given how strongly the laboratory identified with its history as a particle physics facility, it was difficult for the local scientific community to shift its focus to a new research endeavor. LCLS uses the linear electron accelerator to produce x-ray beams a billion times brighter than the most powerful existing sources, including the Stanford Synchrotron Radiation Lightsource. Its completion in April, 2009 put SLAC in a position to do world leading research in physics, molecular biology, chemistry, materials science, and more. Ms. Drell explained that X-rays penetrate matter and their very short wavelength allows us to see where atoms and electrons are in materials. It hadn't been possible to do so at atomic time scales and this ability is gained with an x-ray free electron laser. This is analogous to a series of photographs with a ten femtosecond shutter speed, allowing us to watch a chemical reaction atom by atom or even seeing intermediates during catalysis. For example, photosynthesis is an inefficient and poorly understood process, but it may soon be possible to see and understand it in enough detail to re-engineer it for humanity's benefit. Ms. Drell elaborated that, unlike conventional lasers, using a relativistic electron beam as the laser medium allows us to choose any desired wavelength by tuning the beam. A very tight, micron-scale bunch of about six billion electrons is needed because laser performance depends exponentially on its quality. A relatively unchanged one kilometer section of the linac produces this bunch and directs it through drift space and into the undulator hall. When the bunch moves through the one hundred meters of undulator hall magnets, the electrons spontaneously radiate x-rays that affect the bunch itself until it becomes a set of microbunches that radiate coherently. The electrons are then magnetically bent into a dump and only the intense x-rays stream into the experimental halls. LCLS began successfully lasing several hours after the first campaign started in April, 2009 and has performed spectacularly ever since. It has actually worked much better than anybody anticipated, Ms. Drell noted. Only two thirds of the undulator hall was needed for laser power saturation, a pulse width of less than ten femtoseconds was achieved, a wider range of x-ray energies are accessible, and the pulse energy was up to three times higher than anticipated. Scientists were running experiments and writing papers just six months after the first lasing. An early experiment involved single shot imaging a complex virus, big enough that non-penetrating techniques like electron microscopy are limited. The diffraction pattern allows virion reconstruction, first in two dimensions and recently in three dimensions. Inhomogeneous internal structure was observed but more information is needed to learn how the internal structure works. This potentially game-changing experimental method is being actively pursued by researchers, Ms. Drell said. Another experiment involved a toy catalysis system, where it is possible to actually see the intermediate state and also tell that its desorption occurs due to a weakened bond with the surface. Ms. Drell explained the reconstruction process by describing a series of sample molecules intersecting the path of the x-ray pulses. The x-rays scatter off the sample and the scattering pattern for each pulse is captured as the sample is destroyed. The FEL's short pulse length is the critical feature that enables this “probe before destroy” functionality. The original sample shape is reconstructed from the thousands of noisy scattering measurements. She offered an analogy: Imagine dropping a very misshapen rock into a calm swimming pool, then reconstructing the shape of the rock by watching the ripple patterns at the edge of the pool. LCLS beam time is awarded to the best submitted proposals, but the facility is receiving five times more proposals than it can currently service. Construction starts next year on LCLS-II, which should be online by 2018. LCLS-II uses another one-third of the linac but bypasses LCLS and enters a new undulator hall and new experimental halls. The project hopes to support research with softer x-rays on carbon-based compounds, thicker samples, shorter pulses, variable polarization, and seeding the beam. It is also critical to increase the facility experiment capacity, she noted, so that access to these new capabilities is not restricted to only a small segment of the scientific population. Ms. Drell emphasized that in just a few years SLAC has built a revolutionary new instrument that annihilated its performance expectations and allows us to see the world at the atomic scale as never before possible. However, it is not enough to have facilities and users, Ms. Drell said. She firmly believes that Nobel prizes will be won using the LCLS and wants some of them to be won by SLAC and Stanford scientists. SLAC National Accelerator Laboratory plans to become the premier photon science laboratory by building and operating world leading facilities and performing world leading science at these facilities. However, it must also maintain its position as an accelerator laboratory. It is the core capability and what makes the laboratory special, so they will pursue strategic programs in particle physics, collaborations with CERN, particle astrophysics, and cosmology. New scientific frontiers are being opened at SLAC and it is a time of extraordinary opportunity for physics, chemistry, biology, and material science. With that, she closed her talk and Ms. Taylor invited questions. Someone wondered if it was possible to use gamma rays. Ms. Drell clarified that gamma rays penetrate too well without scattering so samples would be transparent. However, ultra hard x-rays could be used to penetrate larger samples. One person was curious if they planned to reuse the SLAC ring. Ms. Drell noted it has already been reused once, when PEP was converted to B-factory. There have been discussions on how to best reuse it but LCLS-II has priority, she said. In response to a question regarding the maximum time resolution, Ms. Drell explained that a fundamental limit on the length of the electron bunch gives a minimum pulse length of 0.1 fs. A final question concerned the national origin of LCLS components, specifically the undulator magnets. Ms. Drell said that the magnets were contracted to Argon National Laboratory and that the bulk of the project money was spent in the United States. After the question and answer period, Ms. Taylor thanked the speaker and presented her with a framed copy of the lecture announcement. Ms. Taylor made the usual housekeeping announcements and invited guests to apply for membership. At 9:48 pm, she adjourned the 2,287th meeting to the social hour.